The Caravelle Hotel, Ho Chi Minh, Saigon\'s premier hotel is composed of two buildings, the original 10 floor Caravelle Hotel and a new 24 floor tower added in 1998. The 5-star business hotel is centrally located between the waterfront and Cholon (Chinatown) and is only 20 minutes to the airport. Legend Hotel combines natural beauty and sheer opulence to provide the best for the discerning traveler. The breathtaking resort setting and its distinctive architectural interior gives one a feeling of luxury and tranquility. Omni Saigon Hotel, a Marco Polo hotel, features deluxe accommodations of an international hotel, designed to facilitate all the needs of discerning business & leisure travelers alike. Renaissance Riverside Hotel, 5 star hotel in Saigon, Vietnam Renaissance Riverside Hotel is strategically located in the heart of the business and commercial district overlooking the Saigon River. Major office buildings are within walking distance. Sofitel Plaza Hotel, 5 star hotel in Saigon, Vietnam: A luxury 5 star hotel providing a superb range of dining and entertainment opportunities, extensive conference and meeting facilities and 290 elegantly furnished rooms. Caravelle Hotel , 5 star hotel in Saigon Ho Chi Minh City is one of enchantment, one that captivates the imagination, one with a sense of history, and with a sense of tradition that is encompassed at the Caravelle Hotel. New World Hotel, a 5 star hotel in Ho Chi Minh City, Vietnam: Whether you are traveling for business or pleasure, let Vietnam’s premier international hotel ensure your visit is as memorable as it is comfortable. Legend Hotel, 5 star hotel in Saigon- Ho Chi Minh City, Vietnam: Legend Hotel, Saigon combines natural beauty sheer opulence to provide the best for the discerning traveler. Sofitel- Dalat Hotel, 5 star Hotel in Dalat: Built in 1922, this French colonial style hotel places special emphasis on preserving its unique and historical architecture. 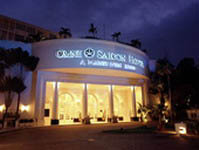 Renovations in 1995 have retained the original colonial style, blending the old French with traditional Vietnamese hospitality. 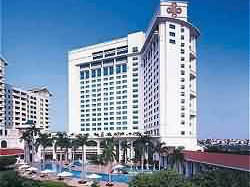 Sheraton Hotel, Hanoi Sheraton Hotel Hanoi: Situated on the picturesque shore of Hanoi\'s largest lake, the Sheraton Hanoi Hotel is only 15 minutes from the city center and 25 minutes from the airport. Deawoo Hotel, Hanoi Hotel, a 5 star Hotel in Hanoi Hanoi Daewoo Hotel is a modern five-star hotel, part of the Daeha Business Centre Complex, which also consists of a 15-storey apartment building and an 18-storey office tower.